There were many more birds around today, on the feeders and in the woods. Perhaps because it's less windy - it certainly isn't any warmer than it has been for the rest of the week. 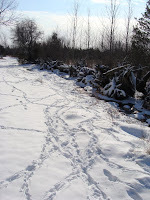 Up by the spring there was ample evidence of the wild turkeys who'd been taking the waters: nearly all the tracks in this picture were made by them. I could hear the turkeys in the woods, but didn't get close enough to see them. There are estimated to be over 600 of these birds in Prince Edward County now, all the descendants of 20 birds that were released in 1989, according to the County's conservation page.